No process is perfect; there’s always room to improve. Unfortunately, many teams have no way to identify, test, and deploy the changes they make, meaning each tweak is a roll of the dice. The savings can be massive, but you need a continuous improvement program to make sure that the changes you make won’t make your operations a whole lot harder. “1 in 10 improvements save money… [each saving, on average,] $31,043 in its first year of implementation. Most successful changes will also make your employee’s jobs easier (or more pleasant) to perform. You’ll be saving time and money, but you’ll also be getting far better value out of your current efforts and operations. However, I’m getting ahead of myself. Let’s start from the top. Ever corrected a spelling mistake in your processes or manuals? How about adding a new step to qualify a task that wasn’t recorded before? What about updating your method to take advantage of better tools or software? All of these and more are examples of continuous improvement. Continuous improvement is a method to make sure that your processes, methods, and practices are as efficient, accurate, and effective as possible. This is done (surprise, surprise) by periodically examining and improving your processes to smash bottlenecks, use the best software, and take advantage of the most efficient methods. 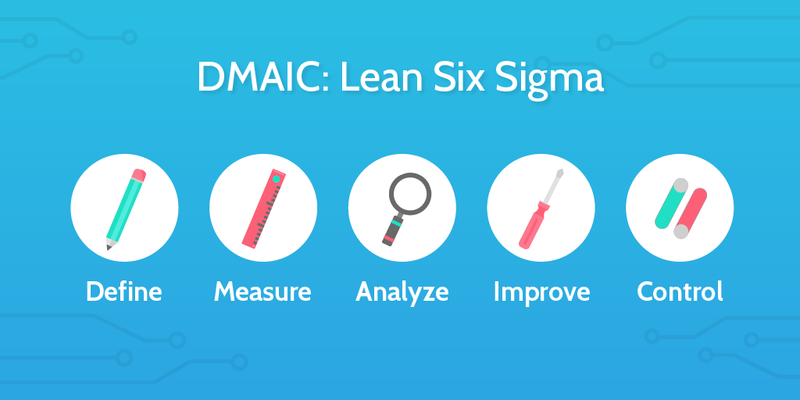 If you’ve ever heard of lean, kaizen, Six Sigma, or DMAIC then this will sound familiar, as continuous improvement is based on similar principles and forms a key part of both of those practices. This is because the primary objective of any changes is to reduce waste and streamline your work. While there are many different methods for achieving continuous improvement (such as process innovation and the Deming cycle), all can be classified into one of two groups; incremental or breakthrough improvements. Continuous improvement is largely practiced using two disciplines; incremental and breakthrough improvements. These can be used interchangeably, but the best way to deploy a thorough continuous improvement program is to combine the two. By doing this you can quickly deal with smaller issues while giving larger items the care and attention they deserve. Incremental continuous improvement is all about making small tweaks to a process, method, or practice to improve it as problems are found. This usually costs less and can be done much faster than using the breakthrough method, but there are a few risks and downsides to doing so. Imagine that you’re working through a regular documented business process (such as client onboarding) when you come across a problem. It’s not a big enough issue that you need to drop everything and hold a meeting to consult your team about it, but if left alone it could cause confusion for the next person performing the process. In this case, it’s much better to correct the mistake yourself and make a note to bring it up at your next meeting. That way you can continue through the process without grinding operations to a halt or interrupting someone else’s work. This is incremental improvement – making small changes or corrections to a process or method without having to review the entire operation. 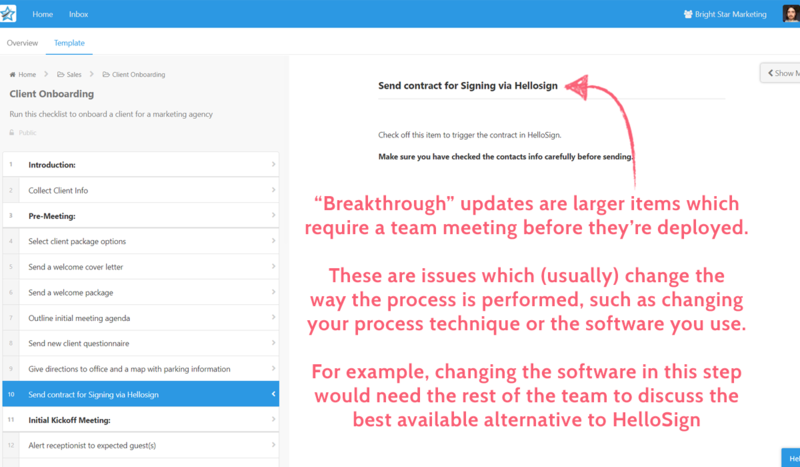 For example, you could correct a spelling mistake or update a link in the process template to make sure that the operation continues to run smoothly and help your team stay at peak efficiency. Again, while this is generally the quicker and cheaper of the two methods, you run the risk of ignoring how much your changes will affect by not including the rest of your team. That’s why you need to be certain that your changes will only improve the process in some small way, and mention what you’ve done at your next team meeting. Breakthrough continuous improvement involves making large changes to a process or method, usually by reviewing the item with the rest of your team and deciding on what to do as a united front. This tends to cost more (in money and time) than incremental improvement, but results in bigger revisions and is sometimes necessary for processes which need to significantly change to remain relevant and accurate. For example, let’s take our client onboarding example again. 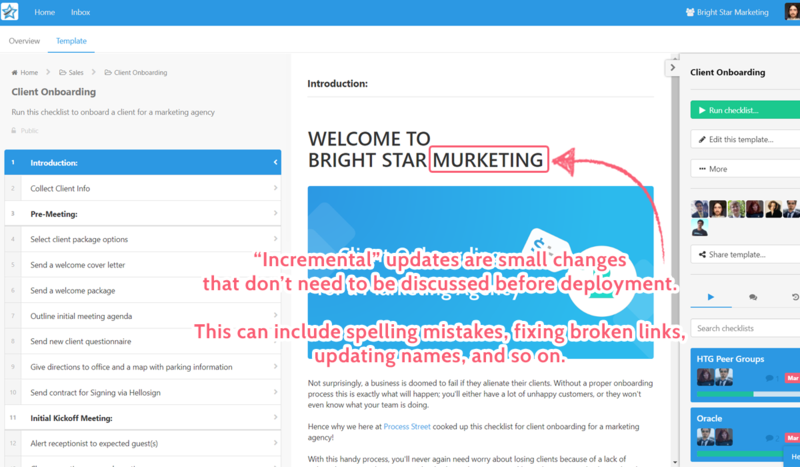 You’ve incrementally updated the process to correct spelling mistakes and keep things running smoothly, but then your team starts using a different CRM. This significantly affects the process, and so a large update is needed to make sure that it’s still relevant and useful. As such, you’ll need to call a team meeting for everyone involved or affected by the client onboarding process. This will let everyone see what needs to change and make their own suggestions based on their experience and current practices. Sure, it’ll take longer than going in and changing the process yourself, but by hosting a breakthrough meeting you’re letting everyone stay up to date while making sure that the process is as good as it can be with the new developments. 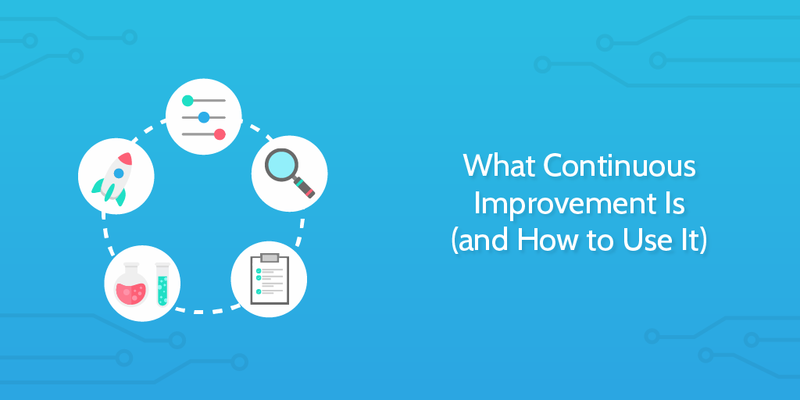 The benefits of continuous improvement are simple; it lets you constantly better your practices to make your team and business more efficient, accurate, and effective. Let’s say that you’ve already documented your processes and are enjoying the level of consistency this gives. Every task is performed the same way every time, and so it’s easy to predict, track, and ensure a certain level of success. Despite this, nothing is perfect. There will always be room to improve your processes and methods, be it through small tweaks or re-engineering the whole approach to supercharge your operations. Is a new employee confused by the instructions for a task? Improve them so that every new hire (and maybe some existing employees) will understand their duties better and get up to speed quicker. Is your current toolkit or software letting you down in some way? Swap it out for something better to let your team scale with your success. It’s a simple concept, but the effect of having a set program for bettering your processes is so great that there’s practically nothing that can’t benefit from it. However, with such a simple (and potentially vague) concept, it can be hard to know how to reach those benefits. How exactly should you go about improving your processes and practices to make sure that you’re not, in fact, making things worse? While it’s entirely possible to use continuous improvement by altering your processes and methods whenever you notice a mistake or bottleneck, it pays to have a set plan to follow. A process for improving your processes, if you will. Incremental improvements are easy to handle, as all you have to do is make the change when you spot the problem. The trick comes with knowing when a change is small enough to avoid bothering the rest of your team. If the answer to both of these is “no”, then go ahead and deploy the change immediately. Remember to make a note to mention the change in your next meeting though, as this will make sure that everyone is up to date on the state of your process. If the answer to either of those questions was “yes” then you’re going to have to put off any changes until you can arrange a meeting with everyone involved in the process. As soon as you find a problem or change that you think would be beneficial, arrange a meeting with the team who performs the process. This should be as soon as possible, as the process will remain broken (or, at best, inefficient) until you can talk about what’s wrong and correct it. In the meantime, if the problem is a damaging one then create a temporary solution which will plug the hole and let your team know what you’ve done. If you want to suggest an improvement instead of fix a flaw, wait until the meeting to change anything. 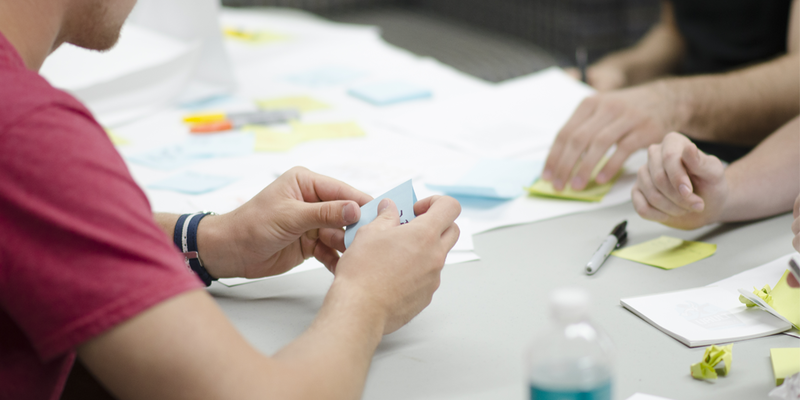 In the meeting, it’s important to clearly identify the problem that needs solving or improvement that needs making. After clearly identifying and defining what needs to be changed, the team needs to agree on the best solution to the issue. If it’s a problem, mistake, bottleneck, or hole in the process, everyone needs to work together to plan out the best way to fix it. For example, if a packing team is struggling to pack boxes for delivery fast enough, it might be better off changing their method to one piece flow instead of batches. If an improvement is being suggested to an already functioning process or practice then it’s going to take a little more work from whoever put it forward. In this case, it’s up to them to convince the rest of the team why the change would be worthwhile and why it’s worth uprooting the current method. For example, if you wanted to suggest managing your operations with business process management software (like Process Street) instead of tools like Microsoft Word, you’d need to list the huge number of benefits of doing so. After hearing how much easier it would be to run, manage, edit, automate, and track your processes and tasks, there should be little question that the change is worth it. Once the changes are decided it’s a good idea to test them instead of deploying everything straight away. The best way to do this is to try and emulate a live environment and monitor performance relative to the original process. 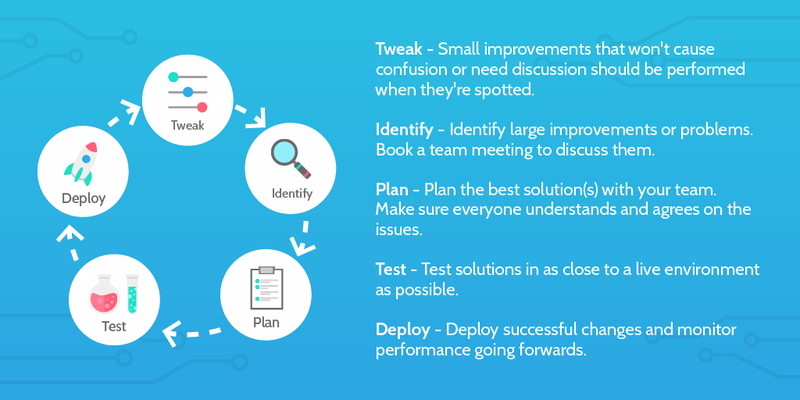 While it’s not always possible to do this, by testing the changes before committing to them you’ll be able to catch any problems with the new method that weren’t predicted in the meeting. A lot can change when taking processes from theory to practice, and now is the best time to avoid creating more potholes than the one being repaired. Once the changes have been made all that’s left to do is deploy and monitor the process going forward. If everything was tested thoroughly then there shouldn’t be any issues, but again, there’s always a chance that any changes will break something further down the line or cause long-term issues. If nothing goes wrong then it’s time to move onto the next process and apply continuous improvement all over again. Otherwise, you’ll need to call another team meeting and go back to the drawing board for the latest problem to surface. Continuous improvement may be a simple concept, but in practice, there are hundreds of ways in which you can carry it out, and many hundreds more mistakes that can ruin an otherwise solid plan. However, with at least the basic care and measures laid out above you can improve your processes without running that risk. Still, even your continuous improvement model will have room to be streamlined and tweaked for peak effectiveness. To aid in this persistent task, check out our other resources on similar topics. We’ve covered process improvement, change management models, and everything in-between, and all of it is free to read! What does your continuous improvement process look like? What causes the biggest problems? I’d love to hear from you in the comments below! First of all great information shared like how to improve. Although in every process there are improvement is necessary and also I m looking for myself. Lastly great articles!!!!!!!! it’s a great and informative article. Thanks for sharing.